French physician at Avignon during the second half of the fourteenth century. In 1373 he was the pupil of the astronomer Immanuel b. Jacob of Tarascon and Orange, the author of the "Shesh Kenafayim." Isaac was well read in rabbinical literature and philosophy as well as in medicine and medical literature. A plague had devastated southern France, the Jews being the first to be attacked. On this account he wrote in 1377 a short treatise, "Be'er Leḥai," on the origin of plagues and the methods to be used in combating them. He was an eye-witness of the cures performed by John of Tornamira, the body-physician of Pope Gregory XI., of whom he speaks well, perhaps influenced by that ecclesiast's favorable attitude toward Jewish physicians. 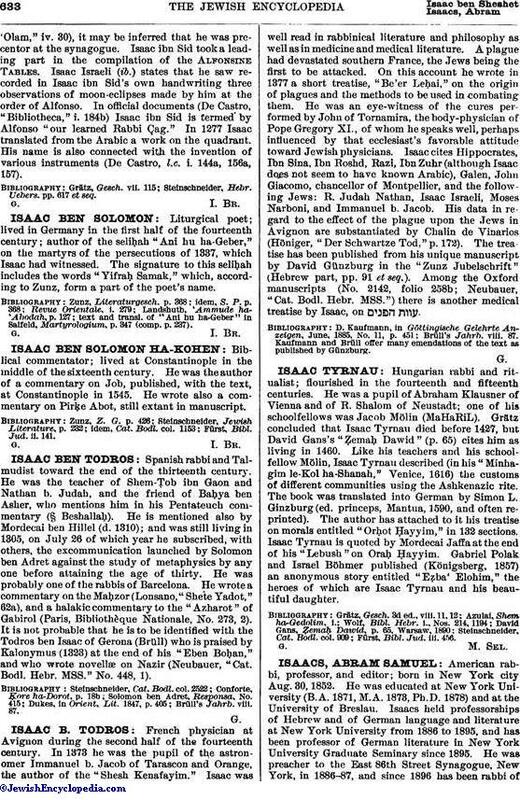 Isaac cites Hippocrates, Ibn Sina, Ibn Roshd, Razi, Ibn Zuhr (although Isaac does not seem to have known Arabic), Galen, John Giacomo, chancellor of Montpellier, and the following Jews: R. Judah Nathan, Isaac Israeli, Moses Narboni, and Immanuel b. Jacob. His data in regard to the effect of the plague upon the Jews in Avignon are substantiated by Chalin de Vinarios (Höniger, "Der Schwartze Tod," p. 172). The treatise has been published from his unique manuscript by David Günzburg in the "Zunz Jubelschrift" (Hebrew part, pp. 91 et seq.). Among the Oxford manuscripts (No. 2142, folio 258b; Neubauer, "Cat. Bodl. Hebr. MSS.") there is another medical treatise by Isaac, on . Brüll's Jahrb. viii. 87. Kaufmann and Brüll offer many emendations of the text as published by Günzburg.